The Samsung Galaxy S5 has generated quite a hype, both before and after its unveil. But unless the hype translates into sales numbers, it can’t be called a success. Well, hold on tightly to your seats, because the Galaxy S5 has already surpassed pre-registration figures that it’s predecessor – the Samsung Galaxy S4 generated last year. 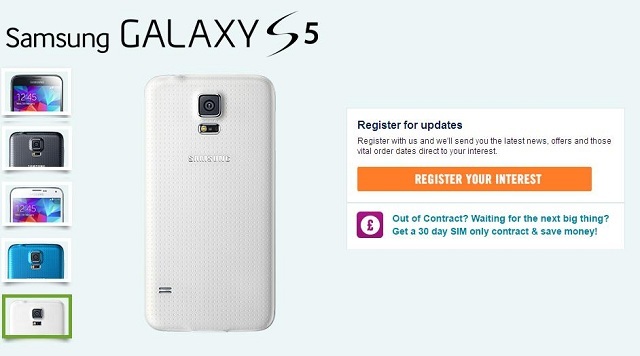 European mobile phone retailer Carphone Warehouse has received 130 percent more pre-registrations for the Samsung Galaxy S5 than it did last year for the Galaxy S4 around the same time last year. The retailer has suggested that the Samsung Galaxy S5 will be a ‘record breaking handset before it even reaches stores’. The handset unveiled at the MWC is set to compete with all major flagship smartphones – the Sony Xperia Z2, the LG G2, the LG G Pro 2 and the HTC One or the M8 and has to generate good figures to keep itself above the fray. But Europe is not the only one enamoured by the Samsung Galaxy S5. 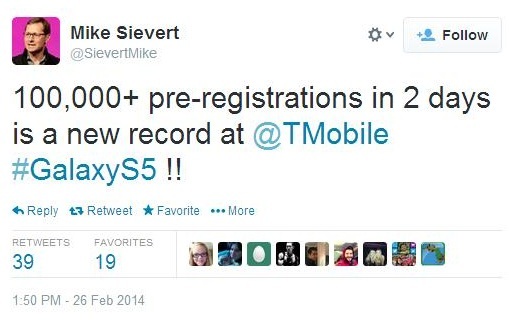 In fact, Mike Sievert, CMO of the US carrier T-Mobile has tweeted that the Galaxy S5 has generated a new record with 100,000+ pre registrations. It seems like the Galaxy S5 has got the start it needs to have a successful year ahead.